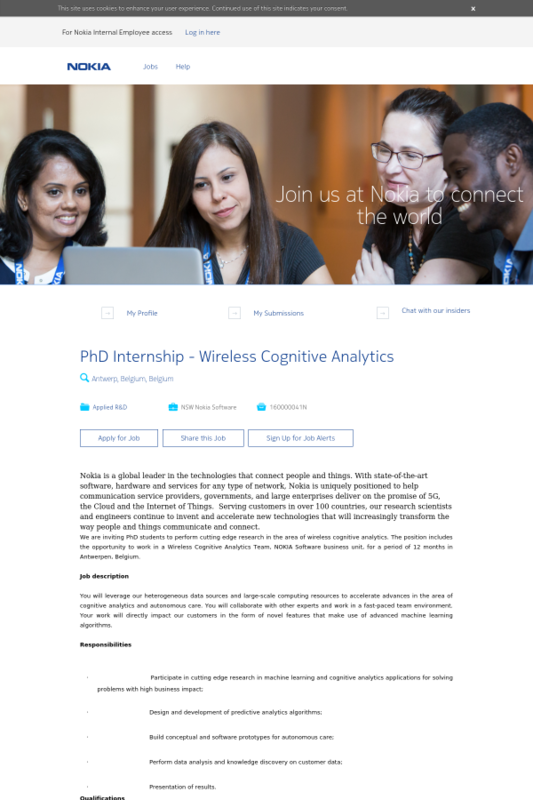 We are inviting PhD students to perform cutting edge research in the area of wireless cognitive analytics. The position includes the opportunity to work in a Wireless Cognitive Analytics Team, NOKIA Software business unit, for a period of 12 months in Antwerpen, Belgium. You will leverage our heterogeneous data sources and large-scale computing resources to accelerate advances in the area of cognitive analytics and autonomous care. You will collaborate with other experts and work in a fast-paced team environment. Your work will directly impact our customers in the form of novel features that make use of advanced machine learning algorithms. Send your CV to Amir Ligata (amir.ligata@nokia.com). For further information please contact Amir Ligata (amir.ligata@nokia.com).